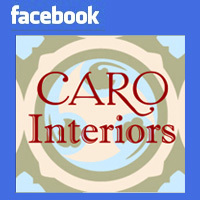 Last week we talked about the great quality of Craftsman tools and DIY homes. This week I want to talk about where to keep those hand tools that we have been learning about in the ongoing Toolbox series. It may come as no surprise to you readers that I love to organize and putting your tools away is what help you be handy and prepared for the next project. 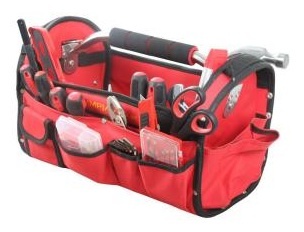 Keeping your tools nicely organized also helps keep you and your loved ones safe in your home. Ever drop a hammer near your foot? Shifting and loosely piled tools can be dangerous. So, how do you know what to pick? I recommend a sturdy 17 inch to 18 inch toolbox, with at least one interior tray. 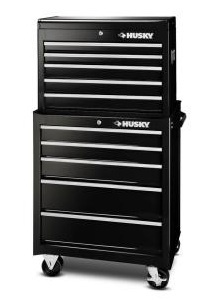 This size of toolbox is long enough to hold your hammer, but not so bulky or heavy that it can’t be tucked away neatly in the bottom of your coat closet. 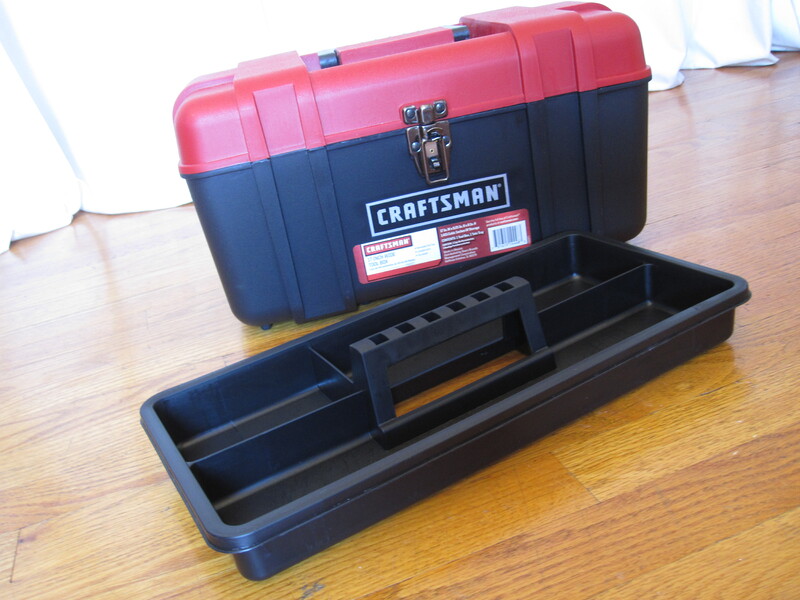 This is the perfect sized toolbox for the tools we are learning about and adding to your collection in the Toolbox post series, too. 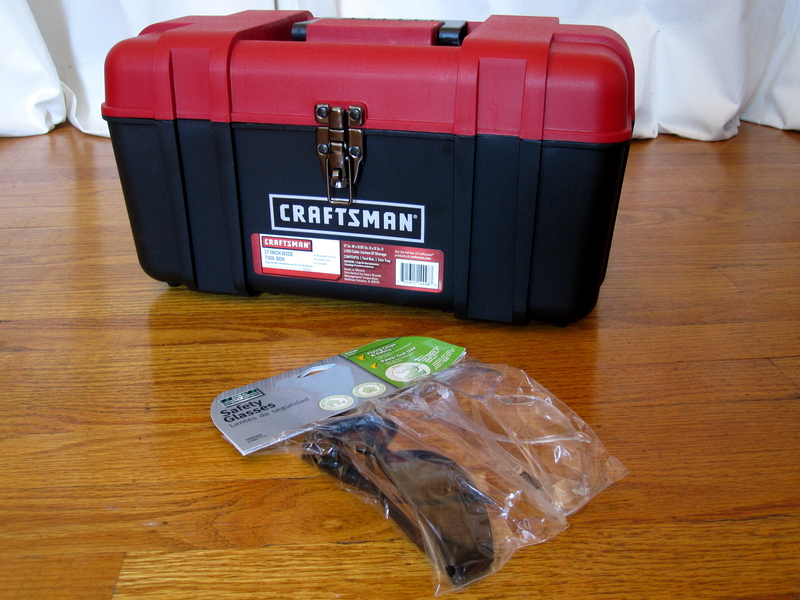 And to encourage you all to get your hand tools organized…I’m giving away a Craftsmen toolbox! 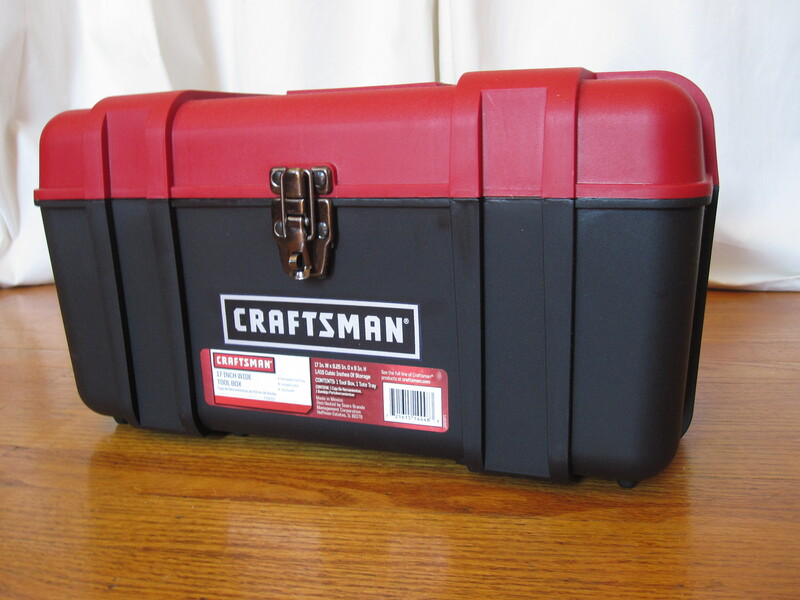 This toolbox is made from rugged plastic and has a sturdy metal clasp, just in case you ever drop it. (I’m told this sometimes happens…I, uh, heard it from a “friend”. Yeah.) 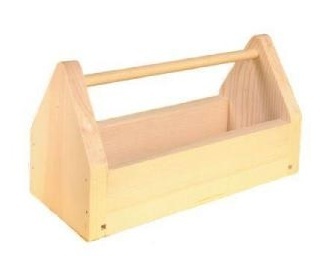 It comes with an interior tray for organizing your smaller items and has plenty of room in the bottom for all the tools you should know how to use. 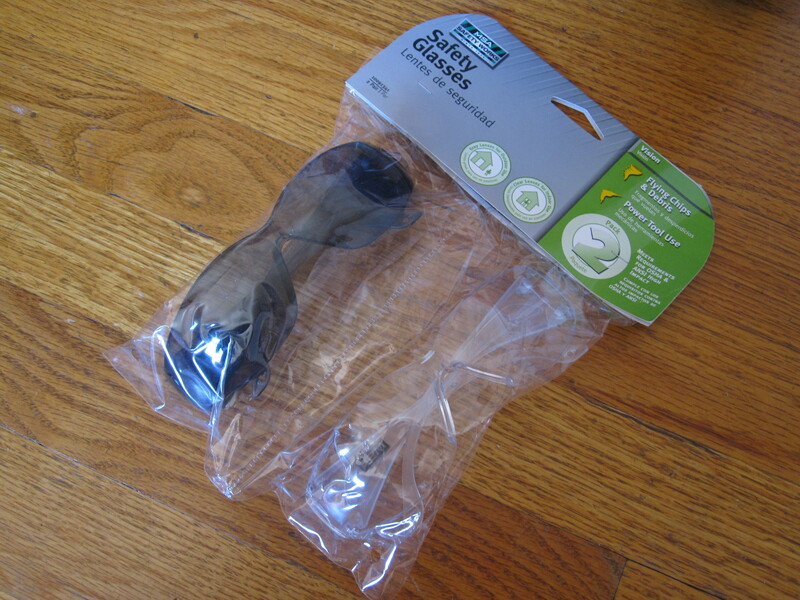 I’m also including two pairs of safety glasses in this giveaway. One pair is clear and the other pair is tinted for working outside comfortably. Every good DIY-er knows safety should always come first! To Enter: Leave a comment that begins with “I WANNA BE MORE HANDY!” and name the hand tool that intimidates you most and why. Does swinging a hammer at a clean wall make you nervous? Are pliers finicky? Do ratchet wrench sets have too many pieces? Let me know what frustrates you and we’ll tackle these tools in future Toolbox posts! Posted on August 4, 2011, in Giveaways, Toolbox. Bookmark the permalink. 9 Comments. I WANNA BE MORE HANDY! Although I adore DIY projects, (and am significantly more mechanically minded than my mathematical genius husband) I find power tools intimidating. This is what comes from having a mother who writes horror fiction! My step-dad had bought me a nice set of ratchets and I was so excited by all of the attachment pieces and all of my potential handyman adventures.. Since becoming the owner of this set last summer, I have only used them ONCE. The headlight bulb needed to be replaced on my car and I was so proud that I had managed to change it out myself (thanks to some Googling). It was a little challenging, however, the challenge wasn’t as much from the Google directions but figuring out how to work my ratchet wrench!!! Yes it’s the hammer for me. Very intimidating, though I did find your post about hammers very useful. My boyfriend is now a pro at hammering thanks to you. I had a bad experience where I actually cut my hand using a screwdriver. Now I can’t stand to be around them. Why would I enter for a free toolbox giveaway you may think? I would love to replace my husband’s hand-me-down old toolbox from his father. Bless his heart, I appreciate the sentiment, but it’s falling apart and needs to be retired. I would love to be more handy with power tools. I’m pretty good with the drill/electric screw driver, or whatever you call it. I’ve seen my dad use a jigsaw and that’s very intimidating. And loud. I think I’m intimidated by anything where you have to clamp down what your cutting or altering or else it could fly off and maim somebody. I WANNA BE MORE HANDY!….okay what’s with the wrench, I can’t seem to get the hang of the darn thing. I WANNA BE MORE HANDY! Miter boxes and good cuts with them get me every time. I WANNA BE MORE HANDY! I’m intimidated by just about everything, but especially things having to do with saws or cutting. I’m always worried that I’ll end up cutting off a finger or a hand, if I lose my focus for evey a second.